This Saturday night the University of North Dakota takes on the Air Force Academy Falcons in the U.S. Hockey Hall of Fame Game at Ralph Engelstad Arena. This non-conference game could have national implications in the pair-wise rankings. UND has a 2-1-1 record in non-conference play this season. This game will highlight the return of former Grafton-Park River forward Chad Demers. The Falcons forward enjoyed success when he played at the Ralph in high school. 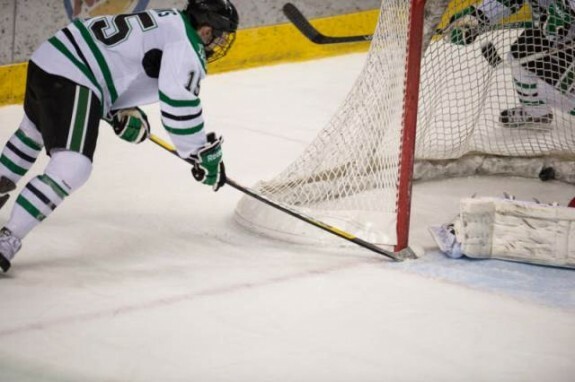 Demers scored the game-winning goal in triple overtime to beat Grand Forks Red River in the 2008 North Dakota State High School Hockey. The Falcons top line is comprised of senior forwards Scott Holm, Chad Demers and Cole Gunner, and they’ve scored (7g-10a—17pts) in six games. Last season, that same forward line was ranked sixth best in the nation scoring 114 points (41-73-114). Also, that same line scored at least one goal in 29-of-39 games. After watching film on the Falcons, UND coach Dave Hakstol was impressed with their top line. All-time, UND is 4-0-0 against the Air Force Falcons. Saturday’s night game will only be the fifth meeting between both teams. UND hasn’t played the Falcons since Oct. 7, 2011, when UND defeated Air Force 4-3 in the Ice Breaker Tournament in Grand Forks. Air Force (2-4-0, 2-2-0 AHA) vs. #3 North Dakota (4-1-1, 2-0-0 NCHC). Game Time: 7:37 pm CT Saturday. Location: Ralph Engelstad Arena, Grand Forks, ND. Last time out: UND won and tied against Providence College (6-1 W, 2-2 T). North Dakota: Forwards: Drake Caggiula (1g-6a—7pts), Nick Schmaltz (1g-5a—6pts), Michael Parks (1g-4a—5pts), Defense: Paul LaDue (3g-4a—7pts), Troy Stecher (0g-6a—6pts) Jordan Schmaltz (1g-3a—4pts). Goalies: Zane McIntyre (4-1-1, 1.93 GAA, .935 SV%), Cam Johnson (0-0-0, 2.68 GAA, .800 SV%). UND Injuries: Mark MacMillan (5g-2a—7pts), out indefinitely. Air Force: Forwards: Cole Gunner (2g-5a—7pts), Scott Holm (2g-3a—5pts), Chad Demers (3g-2a—5pts), A.J. Reid (3g-1a—4pts). Defense: Johnny Hrabovsky (0g-6a—6p), Phil Boje (2g-1a—3pts). Goalies: Chris Truehl (2-4-0, 3.36 GAA, .881 SV%), Connor Girard (0-0-0, 3.50 GAA, .857 SV%). Air Force – The Falcons penalty kill is ranked 17th in the nation (20-23, 87.0%). The Falcons power play is also ranked 19th in the nation (6-29, 20.7%). North Dakota – UND’s penalty kill is ranked 19th in the nation (32/37, 86.%). UND’s power play is ranked 11th in the nation (9/36, 25.0%).